The Sri Lanka Podujana Peramuna, a new political party chaired by former Minister G.L. Pieris, vowed to claim the mantle of the ‘true’ SLFP at its inaugural media briefing held yesterday, in a sign that rifts within President Maithripala Sirisena’s party were widening. Speaking to reporters at former President Mahinda Rajapaksa’s political office in Battaramulla, Pieris claimed the SLFP’s role in Sri Lankan politics had been reduced to whitewashing a UNP administration. “In the wake of the Central Bank bond scandal, the whole SLFP machinery is preoccupied with defending the Prime Minister. The sole aim of the SLFP today is to help the UNP to stay in power,” the former Foreign Minister charged, explaining his reasons for floating the new party. 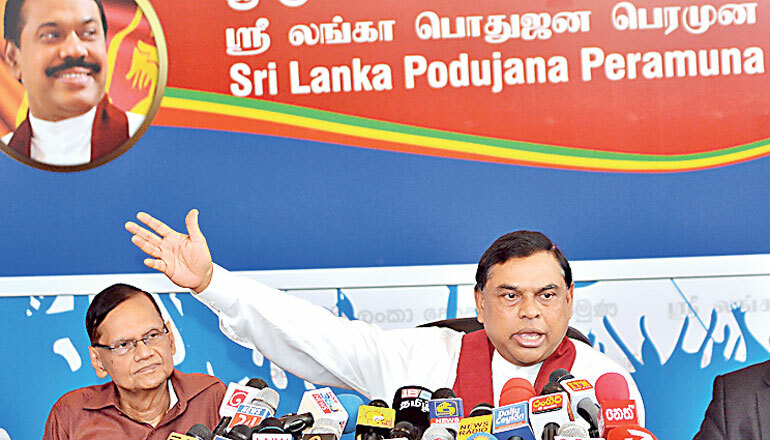 Pieris, who addressed his party’s first media briefing with the former President’s younger sibling Basil Rajapaksa at his side, said the SLFP was a party with a “glorious” political history. “It is the Sri Lanka Podujana Peramuna which will now truly embody the SLFP identity and character,” said Pieris, whose SLFP membership was revoked after he floated the new party. The creation of the Sri Lanka Podujana Peramuna (Sri Lanka People’s Front) is the first attempt by the pro-Rajapaksa faction of the SLFP to affect a major split in the party led by President Maithripala Sirisena. It is unclear if other members of the ‘Joint Opposition’, the faction of the SLFP which did not join the national unity coalition led by the UNP, will join the new party. But Pieris and Basil Rajapaksa, the only significant political personalities in the party so far, are fervently channelling the former President’s spirit and image to make the prospect appealing to other SLFP members. At the entrance to the sprawling three storied house in Nelum Mawatha, Battaramulla, a 15 ft cut-out of the former President – smiling and surrounded by schoolchildren – adorns the length of wall above the sparkling teal waters of a swimming pool. In the courtyard outside the rooms where press are assembled for the Podujana Peramuna’s inaugural media briefing stands a banner of a similar size, featuring golden rice fields with Mahinda Rajapaksa’s smiling visage at its centre. The words ‘Podujana Pathuma Wapurana Rankethai’, loosely translated to mean ‘the golden fields where the people’s hopes are sown’, are scripted under his image. The former President may not be a member of the Sri Lanka Podujana Peramuna officially yet, but his presence and the personality-driven ethos of his presidency is all-pervasive. “He is our vision. He is the true leader in our hearts. We are his followers. These are his aspirations we are trying to fulfill,” enthused former Economic Development Minister Basil Rajapaksa, who became a member of the SLPP earlier this week. According to Basil Rajapaksa, national security and economic security could only be guaranteed by a party and a Government led by former President Rajapaksa. “There are 36,000 villages in this country. All of them will rise in support of us,” he claimed. Asked by reporters if he was worried about the SLPP being reduced to a third force when the country already had two main political parties, Rajapaksa said he was confident that it was the Podujana Peramuna that would soon become one of the two main parties in Sri Lanka. “The SLPP is a new tree, but it is born from the seed of the SLFP,” he said. The former Foreign Minister in President Rajapaksa’s Cabinet said the SLPP was attempting to fill a “huge void” in the country’s political sphere. Pieris said that Opposition to the Government was mounting in every quarter. “This is why they are delaying elections. When we were in Government, we held elections every six months,” the former Foreign Minister said. According to Pieris, the new party was likely to garner an initial membership of about 1 million, with 100 membership cards set aside for Parliamentarians who might seek to join its ranks.